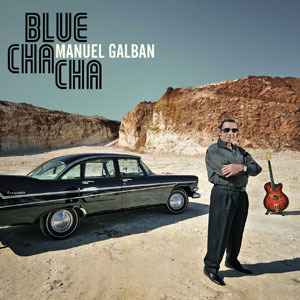 “We began with a selection of about one thousand tunes,” said Cuban guitar legend Manuel Galbán and the album’s producers Juan Antonio Leyva and Magda Rosa Galbán. Indeed, Blue Cha Cha, recorded in 2010 and the first solo work to be released by the late guitarist in many years, had been hatched conscientiously. This was a characteristic adopted by Galbán throughout his career. He was a musician who liked to allow projects to mature for as long as necessary to ensure optimal results and was averse to embarking on unwarranted adventures. When you first listen to Blue Cha Cha, a CD/DVD set for release June 26, 2012, on Concord Picante, a division of Concord Music Group, what strikes you is the variety of styles that show us once again the very best of Galbán, the maestro who left the famed Los Zafiros, then astounded the world with Buena Vista Social Club™ and, subsequently, with Ry Cooder on their sensational, #1 Latin Pop and GRAMMY® Award winning Pop Instrumental album, Mambo Sinuendo. 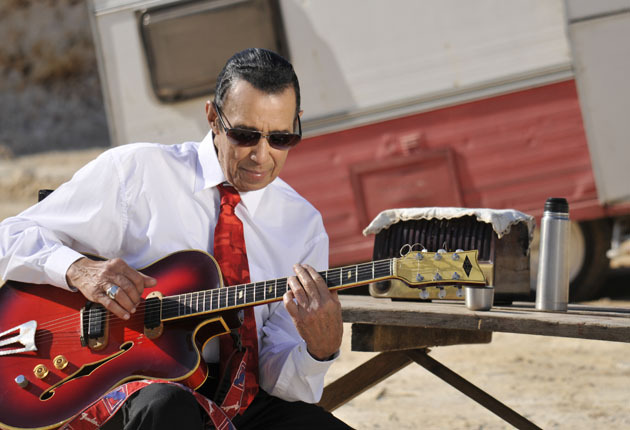 After Galbán moved to Havana, he became one of the most active musicians on the Cuban music scene, a guitarist who was highly sought after by countless leading bands throughout his sixty-year career. Unquestionably, Blue Cha Cha is virtually a musical encyclopedia in which Galbán pooled the experience built on a lifelong career devoted to music. This knowledge assisted him throughout his entire life and helped transform him into a genuine benchmark of popular Cuban music. Blue Cha Cha is an ambitious and generous album. At an early age, Galbán became one of the most innovative, creative and original musicians his nativeCubahad ever seen, as well as an instrumentalist who achieved much worldwide acclaim. For this project, there was nothing better than going over his career and choosing all the music that always had meaning to him – Afro-Cuban music, bolero, Latin American music, rhythm and blues – and inviting some of the biggest names from these styles to perform on the album. Omara Portuondo, Rosa Passos, Trío Esperança, Eric Bibb, Sissoko Ballaké and Marcelo Mercadante, among others, all feature alongside Galbán. There are one-on-one arrangements with the aim of triumphing together rather than vying for the limelight, and they show how the sounds of Galbán’s guitar preserve sensitivity and relevance. The dulcet tones of Rosa Passos almost seem like a whispered declaration of love. “I felt very happy and honored when I was invited to participate on the beautiful song ‘Alma Mía’ on Manuel Galbán’s final album,” Passos says. Galbán revisited his times with Los Zafiros on the track “Bossa Cubana,” as if the aim was to close a professional circle. Galbán may not have been who he was if not for the years he spent with a group that changed the course of Cuban music. These words lay testimony to an ever-apparent aspect: when you bring musicians from entirely different walks of life to a studio and they can connect regardless of language or culture. Galbán revisits the sound that he himself forged and so many have tried to imitate, his unique playing style was perfectly suited to the most modern sounds. Galbán’s career had brought him to all four corners of the world, where all his inspirations and experiences are revealed on this final recording. As we approach the one-year anniversary of Galbán’s passing (July 7, 2011), the result is a recording with an almost orchestral feel, bursting with the energy that only he could glean from the guitar. With his uniquely personal stylistic elegance, Galbán could transform any tune into a gem, adapting it to a language ahead of its time, a language he created, where the sounds of the instrument bore as much significance as the discourse of the guitar. Galbán was a cornerstone of the six-string instrument, and he achieved something that very few are ever able to do: only a couple of bars are needed to recognize his unmistakable style. See Blue Cha Cha come to life with interviews and a historical documentary DVD filmed inHavana,Cuba andParis,France. Galbán, through personal anecdotes shared by his dearest friends and musical influences, reflects on his lifelong, milestone-tinged career which ultimately altered the landscape of popular Cuban music. This bonus DVD features Magda Rosa Galbán, Trio Esperança, Eric Bibb, Rosa Passos and Omara Portuondo, among others.